What is a Kroket (or Croquette)? The common English translation of kroket is croquette. A typical Dutch croquette is made of meat ragout (or salpicon) covered in breadcrumbs, and deep fried until golden and crispy. It's possible that France's King Louis XIV was one of the earliest fans of the kroketje. Many people think of the kroket as a quintessentially Dutch delicacy, but according to Johannes Van Dam, who was a well-known food expert in the Netherlands, the Sun King's chef was the first to describe them in writing. In fact, Van Dam tracked down a French recipe for croquettes dating back to 1691, while the earliest Dutch recipes supposedly come from the 1830s. Even the name kroket was taken from the French - from croquer, or 'to crunch'. Croquettes gained in popularity in the Netherlands in the 18th century, when French food was all the rage in the Low Lands. And, while their origins are French, what is typically Dutch is the way these treats are consumed today. Kroketten are often mass produced and bought ready-made from fast food chains and snack bars and consumed as street food in the Netherlands. The Dutch love their kroket so much that McDonald's even created a burger with a kroket-patty called the McKroket. People also purchase frozen croquettes at supermarkets and pop them into the deep fat fryer at home. As with any product, all this mass production has meant that the quality has suffered, and the delicacy has gained a reputation for being filled with meat of dubious quality. It pays to shop around, and there are still a few brands and shops that make excellent croquettes. The broodje kroket, a soft white bun with a deep-fried croquette and mustard, is a Dutch lunch-time favorite. We particularly like the ones at Van Dobben lunchroom. 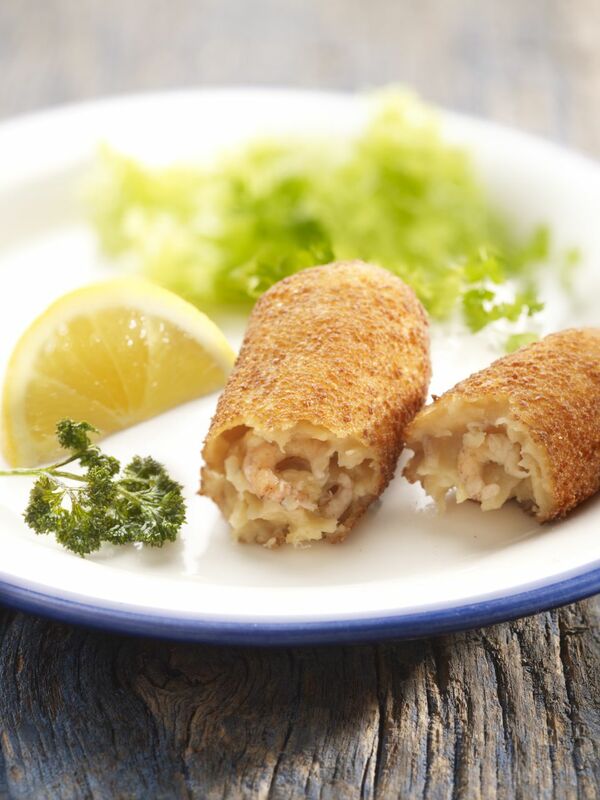 Another premium brand to look out for is Holtkamp (try the patisserie's shrimp croquettes). In addition to classic Dutch croquette flavors, such as beef- or veal croquettes, there are other flavors like chicken satay or goulash, as well as a host of croquette-shaped concoctions, with fillings such as Indonesian-inspired bami noodles (also called bamibal) and nasi rice (or nasibal), as well as potato croquettes. The bitterbal, a small round version of the croquette (usually made with beef or veal), is a popular bar snack.